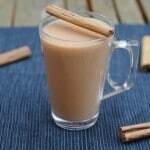 If you are a fan of Starbucks drinks, then chances are you have tried a chai tea latte. Full of the flavours of Christmas, this is one of my favourite hot drinks. I have made a really simple version of it that will save you calories and money.